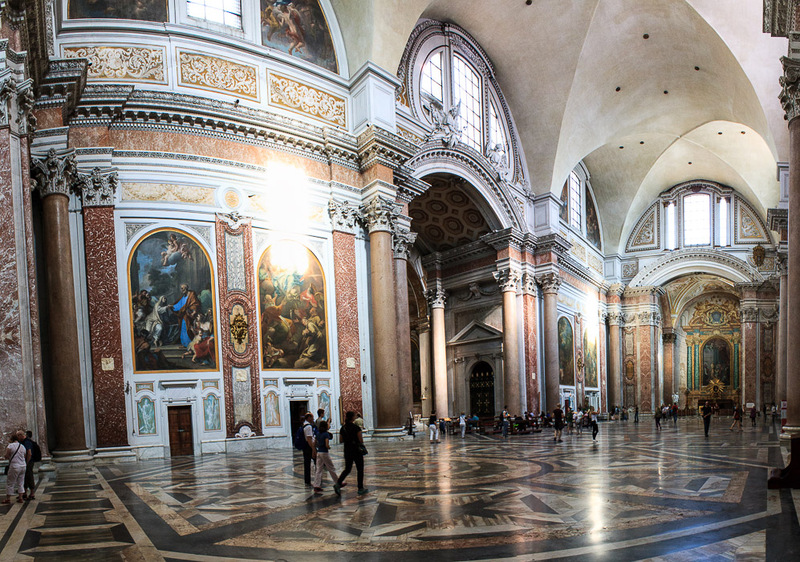 The basilica of Santa Maria degli Angeli e dei Martiri (Saint Mary of the Angels and the Martyrs) was ordered to be built inside the frigidarium of the Baths of Diocletian in 1561 by Pope Pius IV. 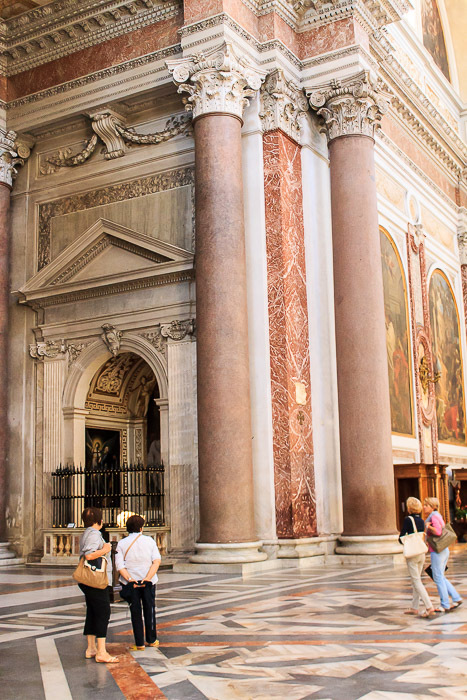 Michelangelo adapted the remaining structure from 1563 until his death in 1564 to enclose a church. 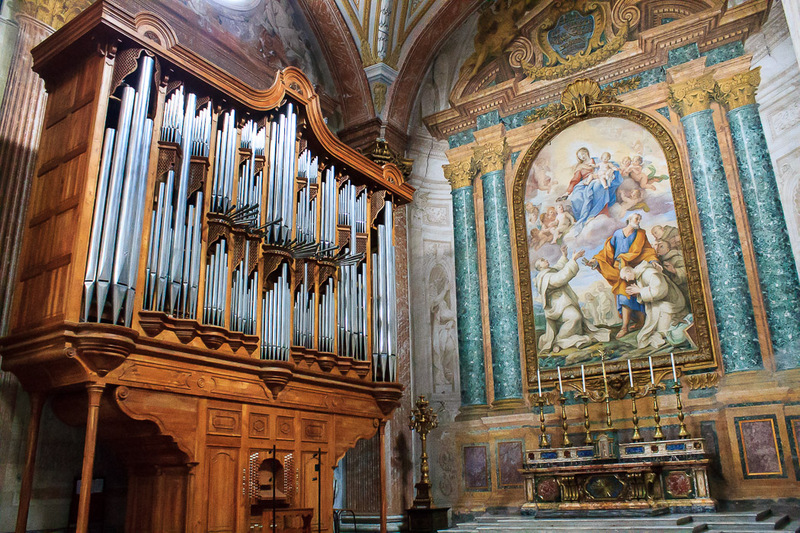 The church is dedicated to the Virgin Mary, to the angels, and to the Christian slaves who died building the baths. 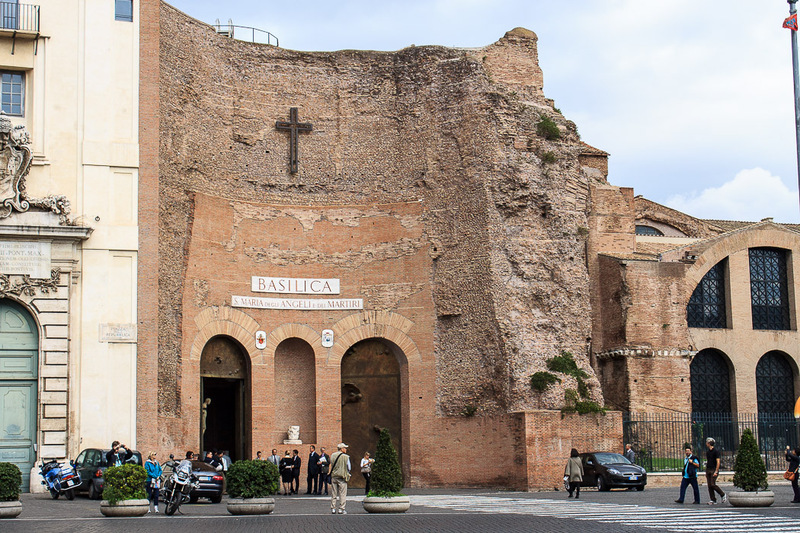 The front facade (1st photo below) is one of the original interior walls of the Baths of Diocletian, between the no-longer-existing caldarium and the still-existing tepidarium, which serves as the vestibule of the church (2nd photo below). The 'Angel of Light' sculpture (3rd photo below) from the year 2000 is in this vestibule. 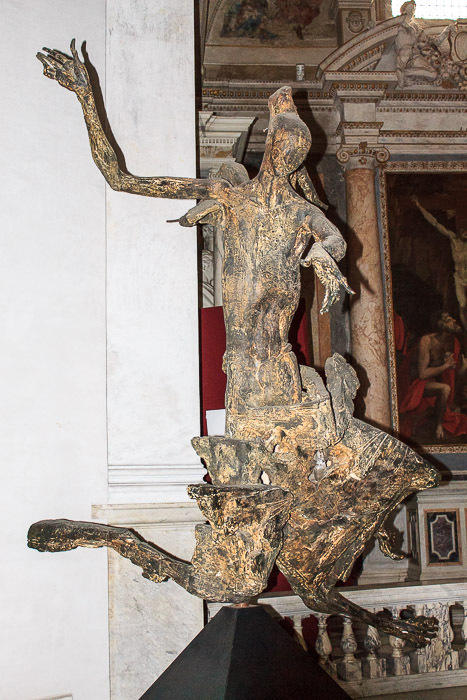 So is the Head of St. John the Baptist by Igor Mitoraj, 2006 (4th photo below). 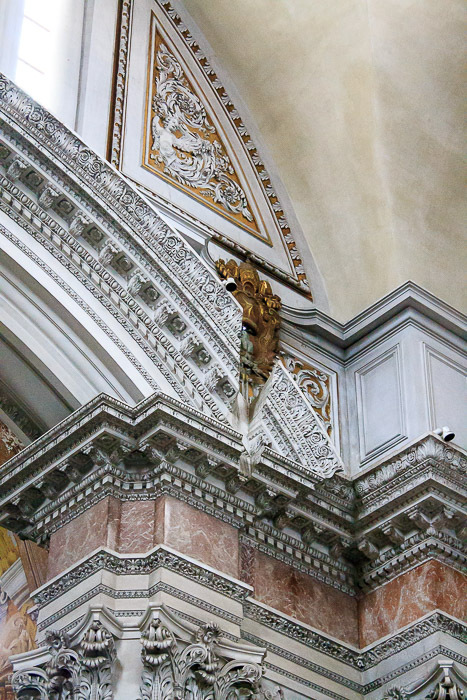 See all Santa Maria degli Angeli e dei Martiri photos. 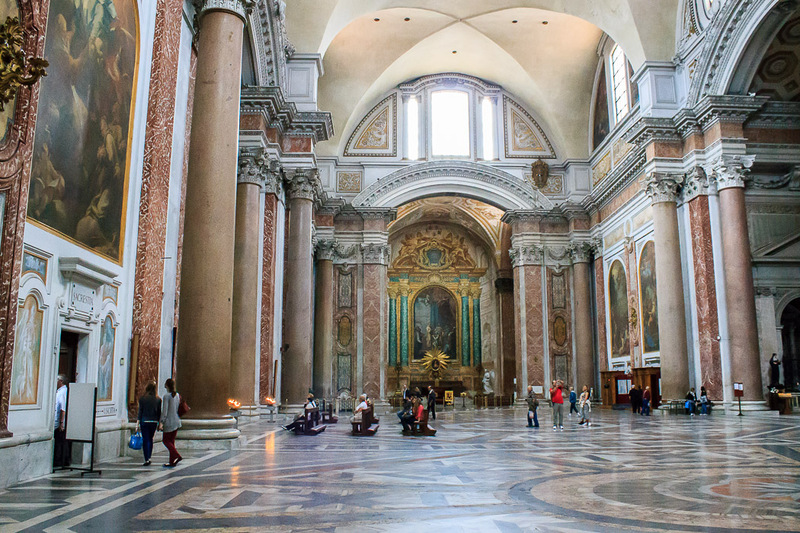 Once you pass through the vestibule, you reach the huge interior of this church (1st and 2nd photos below) which was built in what used to be the frigidarium of the baths. 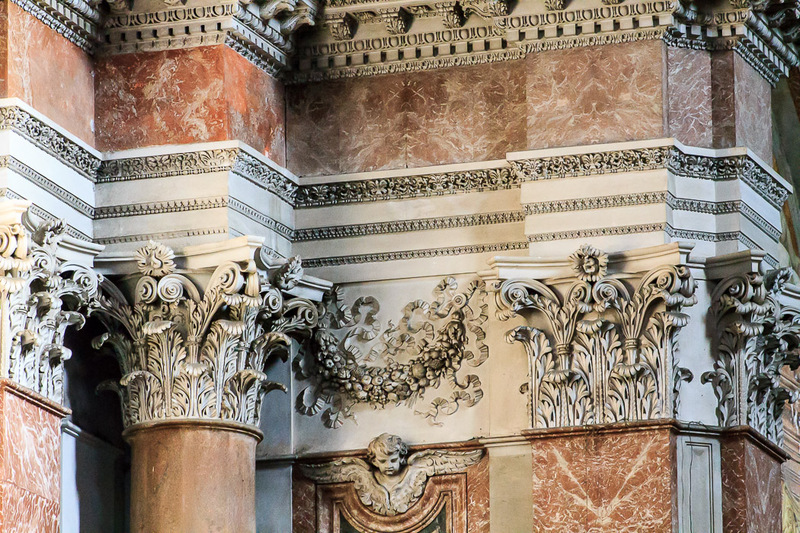 The interior is quite ornate, with beautiful marble walls and floors, and with 8 massive pink Egyptian (Aswan) granite columns (2 of them are shown in the 3rd photo below) which have not moved since antiquity and which support the ceiling of three groin vaults. 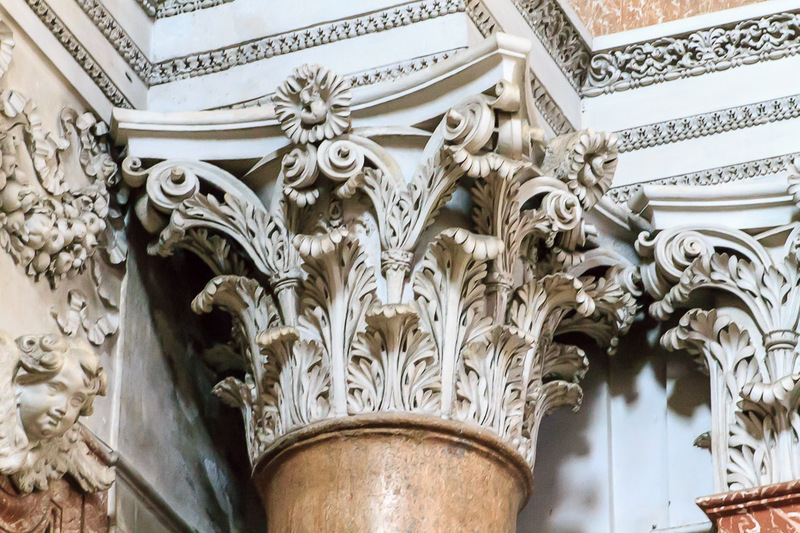 The Corinthian capitals on top of those columns are quite ornate (4th 5th and 6th photos below). 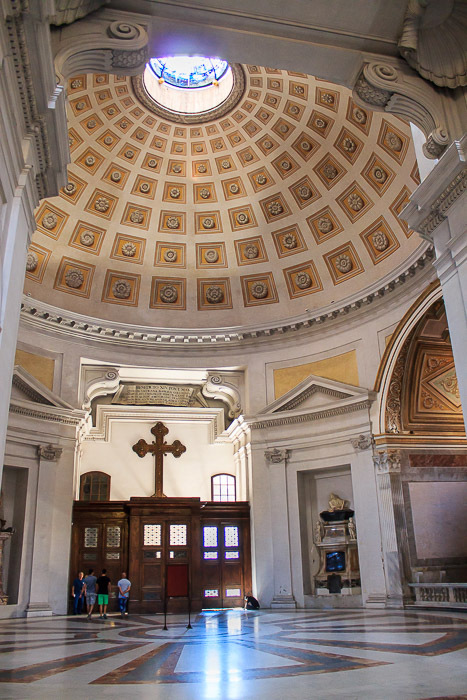 The transept of the church of Santa Maria Degli Angeli, inside the Baths of Diocletian. 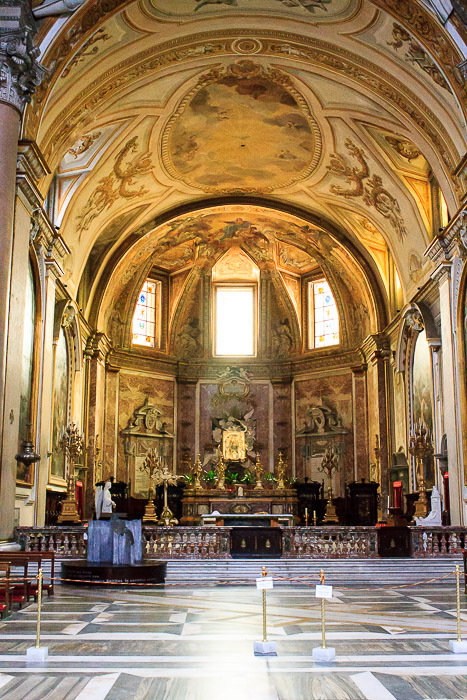 The main altar is at the far end. 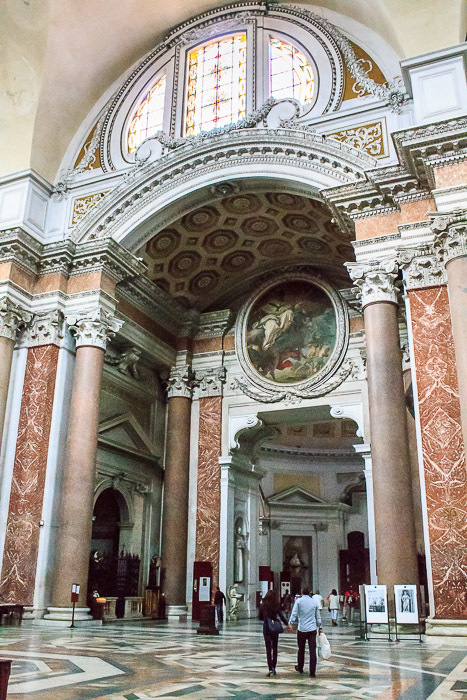 The main altar is shown in the 1st and 2nd photos below. 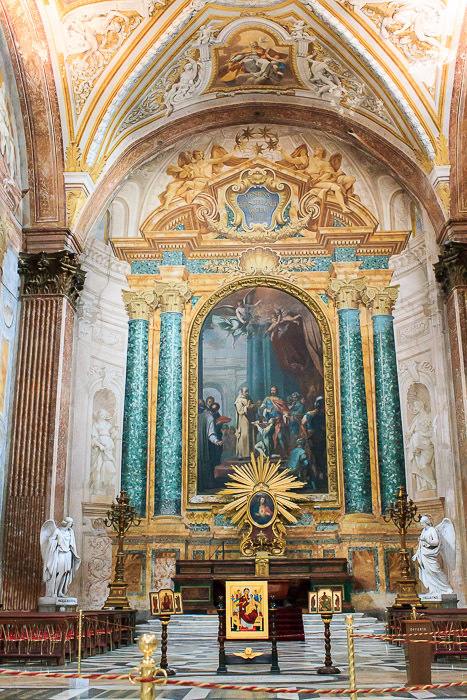 The altar and painting of the Immaculate Conception, by Bianchi, is shown in the 3rd and 4th photos below. Another altar is shown in the 5th photo below. 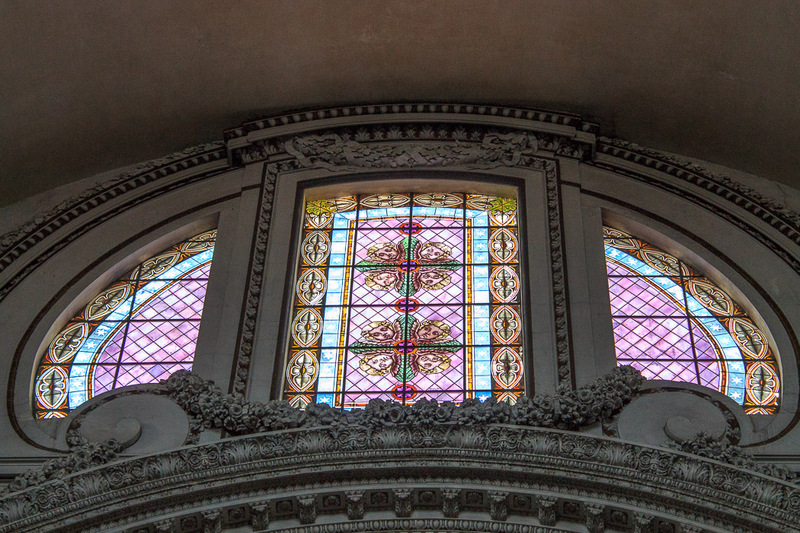 A stained-glass window and its location within the church are shown in the 6th and 7th photos, respectively. 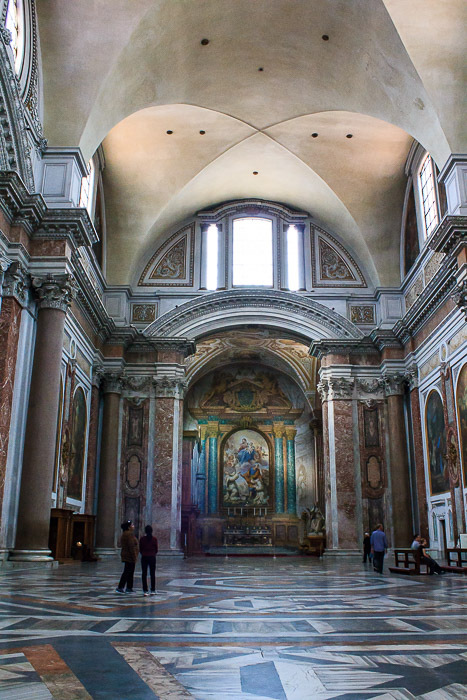 In my opinion, the most interesting thing in this church is a meridian line built by Francesco Bianchini in 1702. A small south-facing hole in the wall (1st photo below) allows a ray of light from the sun to fall on the meridian line in the floor (2nd photo below) at solar noon each day, which happens between 11:54 AM in late October and 12:24 PM in February (ignoring daylight-savings time). 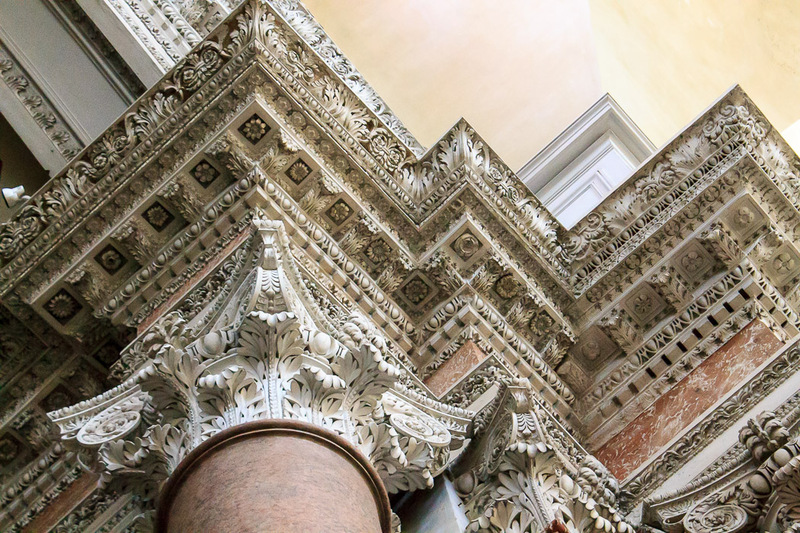 It was built to check the accuracy of the calendar, to predict Easter, and to give Rome a meridian line as important as the one in the cathedral of San Petronio in Bologna. Since it was built into a building which was 1500 years old and was very probably finished settling, the meridian was very stable. At the summer solstice, the sun appears highest in the sky and its ray hits the meridian line at the point closest to the wall. At the winter solstice, the sun's ray falls on the meridian line at the point furthest from the wall. At days between these two extremes, the ray touches the line between these two positions. 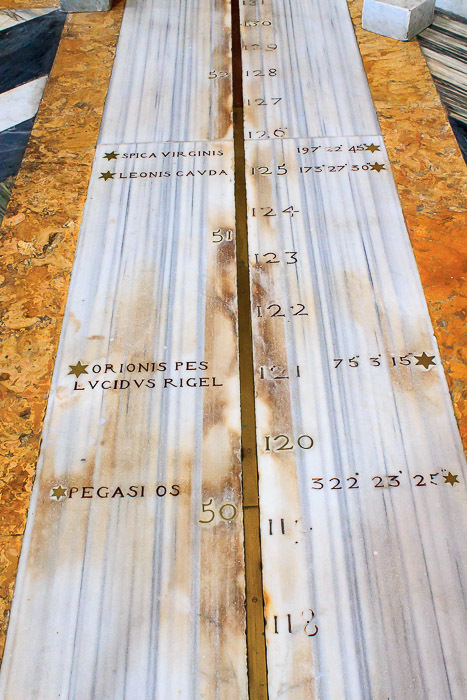 The longer the meridian line, the more accurately the observer can measure the spot where the sun ray falls, and the more accurately the length of the year can be calculated. 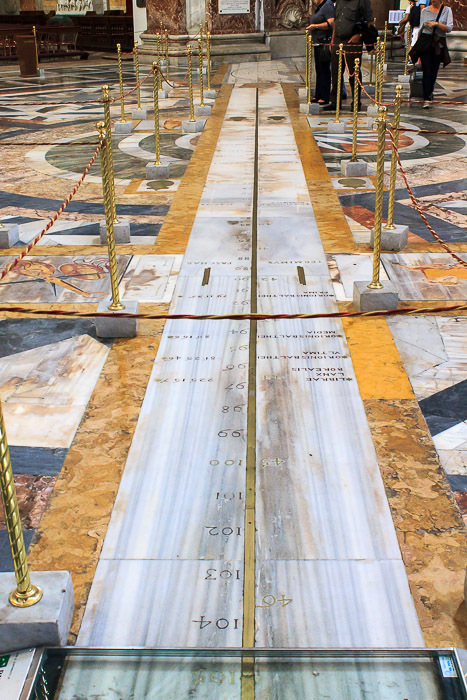 This meridian line is 144 feet long, 128 of which are usable between the extremes of the sun's ray, providing a high degree of accuracy. 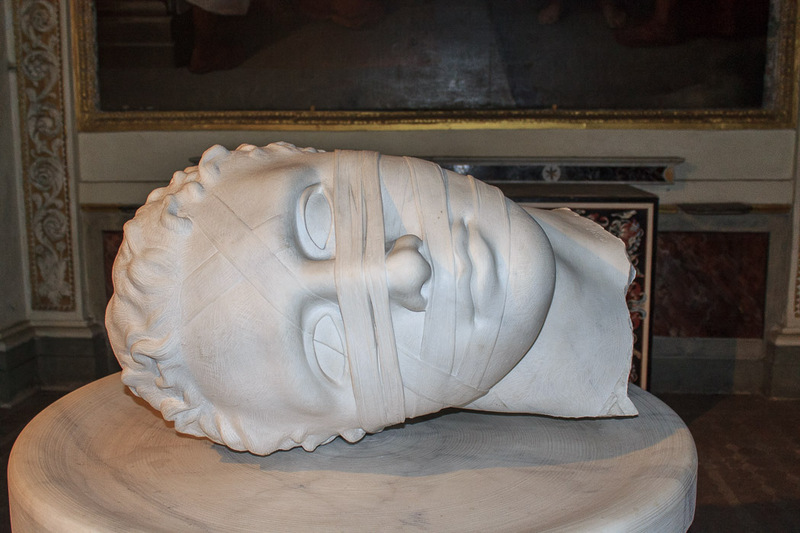 It is made of a bronze line, enclosed in yellow-white marble. Also, the higher on the wall the hole is located, the higher the accuracy. The hole for this meridian line is 66 feet up. Alongside the meridian there are some squares representing the constellations: they correspond to the points on a tangent line where the solar dot passes when the sun enters the respective sign of the Zodiac. On the left side of the brass strip there is the indication in degrees of the zenithal distance of the star projected on that point. On the right there is the indication of its trigonometric tangent line.